Hello and welcome to the first of our Seasonal guides for beginners! This time of year, more than any other point in the calendar, is when we say hello to the largest influx of fresh disciples to the guitar. If you have no previous experience of guitars through friends or family, this world can prove pretty daunting. Even if you do, we recommend sticking with us through this blog (and the others that follow!) to give yourself a rounded grounding on what’s out there, what you should be checking out and why. In this edition, we have zeroed in on half a dozen electric guitars that we believe are amongst the best for starting on. There are of course loads out there but not all guitars are born equal! We don’t think that you should ever have to tolerate a poorly made, badly playing instrument, regardless of the price. We believe that quality does not have to cost the Earth and we think that a good guitar is critical at this early point for players to both have fun and want to continue learning and playing! Why electric guitars? Why not start on acoustic? Well, we think you should begin learning on whatever you fancy! It’s you that’s playing and learning so you need to please yourself first. For our two pence-worth, we’d say that the sound of an electric guitar is more likely to be the sound you’re after: it’s probably the one you’ve heard most and it’s the sound you want to be able to make. Also, electric guitars have thinner, narrower necks and less tension in the strings so they are easier to play. More exciting and easier to play? Win! So, let’s just get stuck in, shall we? Our first choice is the most affordable official take on the Fender Stratocaster. Otherwise referred to as the Strat (or S-type, if we are referring to non-Fenders), this is perhaps the single most iconic design for an electric guitar. Most people across the planet will recognise this as an ‘electric guitar’, such is its ubiquity. The Strat design is perfect for beginners: it sits comfortably on the lap whilst sitting and against the hip whilst standing; it offers easy access to all of the frets and you can achieve a pleasing range of sounds that are instantly ‘electric guitar-like’! This particular model is from Squier. 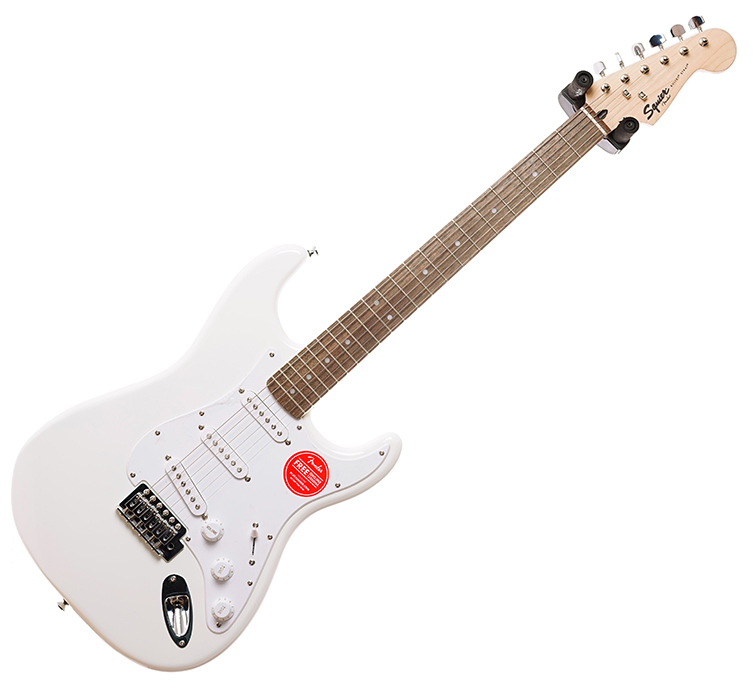 Squier are Fender’s official overseas imported guitar brand. Guitars with the Fender logo on the front of the headstock are made (with a few notable exceptions) in the USA and Mexico. They are perhaps for more experienced players (though well-heeled beginners should definitely charge on if the notion takes them!) so these less expensive Squier guitars suit beginners very well. The ‘Bullet’ range are the most affordable of the Squier guitars but, happily, cheap does not in this case equate to nasty. 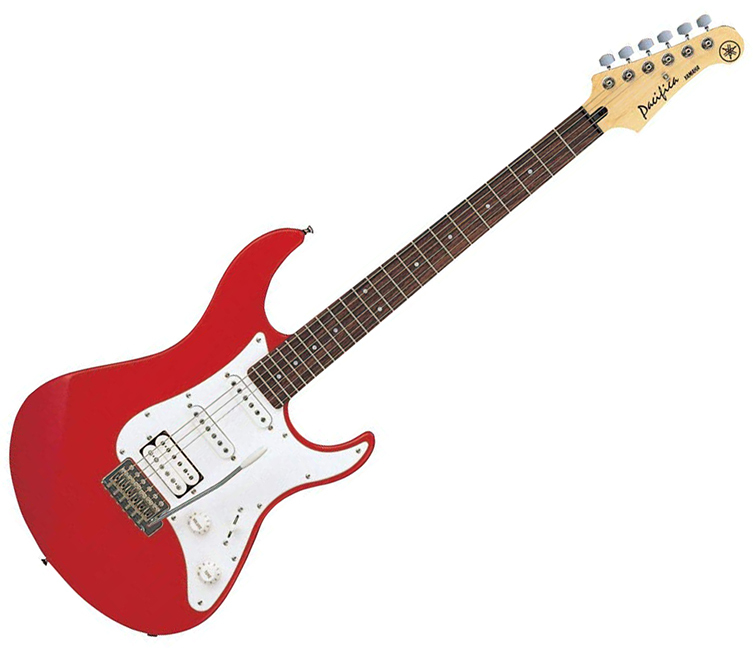 We are happy to recommend this entry level Stratocaster as a great beginner’s model. It has the ‘correct’ shape and design so certainly looks the part. It is easy to play and, importantly, is a lot of fun! Being that this is a Stratocaster, it has three single coil pickups and a tremolo, otherwise known as a whammy bar. Single coil pickups give a snappier, more twangy sound than their counterparts (humbuckers), which we’ll see later. A selector switch on the front on the guitar gives you 5 choices for sound. These come from different combinations of those three pickups. The tremolo/whammy bar is a device for raising and lowering the pitch of a note. You’ll hear terms like ‘dive-bombing’ and ‘wide vibrato’ during discussions of whammy bars. These terms basically amount to varied levels of pressing down on the metal whammy bar (it’s attached to the bridge) to bring your note in and out of pitch, subtly or dramatically. It’s tons of fun but, even on expensive guitars, it can throw your tuning out so do exercise caution eventually! We’ve opted for the Arctic White model of this Strat. Why? Easy. Google Jimi Hendrix at Woodstock. Ahhhh, now you get it! Okay, let’s move on! Sticking with Squier’s Bullet imprint, our next choice is the decidedly artier Bullet Mustang HH in Black. The Mustang is a very hip counter-culture choice beloved of 80s and 90s Alternative Rock artists like Nirvana and Sonic Youth. Until recently, affordable Mustangs like this were not a thing that existed so we applaud Squier for doing their research and understanding what people want! So, how does this differ from the Strat we just looked at? Well, the main differences (apart from the shape of course) are the pickups and the size. Let’s take the size first. The Mustang was always designed as a ‘student’ model (as if we ever stop learning on guitar…) and was made with a smaller body to suit younger players. It also has a smaller scale length. Scale length relates to the length of the neck from the nut (before the first fret) to the 12th fret. Shorter scale lengths make the guitar easier to play since there is less distance and hence less tension. All of this is great news for beginners! And Mustangs are for adults so don’t fret about the smaller size, it’s just part of the Mustang charm. Now, the pickups. You’ll notice that these are bigger than the ones on the Strat. These are humbucker pickups. Look closely and you’ll see that they appear to be two single coil pickups stuck together. Well, that’s not too far from the truth! In practical terms, humbuckers sound thicker, louder and more ‘Rock’ than single coils. So, the Bullet Mustang is easier to play, especially for younger/smaller people, and has a higher output sound. You lose the whammy bar with this but that may not be a bad idea if you are not used to retuning guitars! The Mustang is a cool choice for sure. Let’s meld these two worlds somewhat with our next choice. In all honesty, there is no way a list of quality beginner’s electric guitars can exist without at least one addition from Yamaha’s Pacifica range. We’ve actually gone for two! Yamaha, as most people would attest, always make good quality stuff. Great pianos, great motorbikes and great guitars! Yamaha really is a seal of quality and these entry level Pacificas are further proof of this. Pacificas are legendary amongst guitarists for being consistently great quality beginner’s instruments. Let’s have a look at the two we’ve chosen. Our first choice is the Pacifica 012. 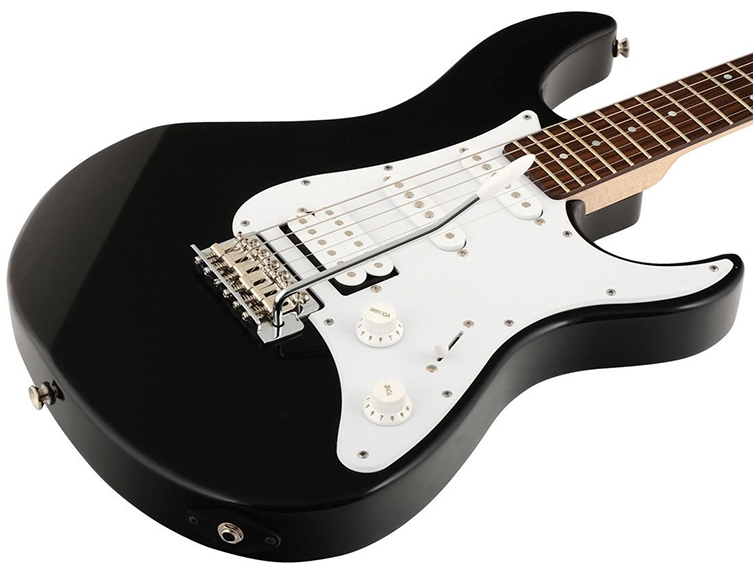 This model is based on the Stratocaster but has redrawn curves to give it its own identity. Sound wise, you get the best of both worlds with one humbucking pickup at the bridge and a pair of single coils in the other traditional positions. This means that twangy, spanky sounds co-exist with the chunkier, more sustaining sounds form the humbucker. All of this from one guitar! And this also has a whammy bar! You can have it all, and for relatively little outlay. Yamaha’s quality is built in. Our next model is the Pacifica PA112JRM. This model is very similar to the previous Pacifica but has upgraded wood for the body and an exiting sparkly finish! Yamaha have used Alder for the body. Alder is a popular choice for guitars of this style and offers a more resonant tone. This makes the PA112JRM a great buy since it isn’t too much more expensive! And that finish! Bling! Metallic finishes are always a great touch and this bright Red colour is beautifully bold! Our next choice is a little more expensive than the rest but we believe it offers real quality and value for the money! Ibanez are one of the biggest guitar brands on the planet and are enormously popular with more Rock-orientated guitarists. You can tell be the sharp looking headstock that this S521 is mean and ready to Rock hard! This model is based on Ibanez’s Sabre series. That means that the body is sleek, contoured and thinner than what we’ve seen so far. It has 24 frets, a few more than the others, and, like the Mustang, it has two humbucker pickups. This Ibanez is a brilliant choice to newbies of a more ‘Metal’ persuasion and is certainly high enough quality to take in the studio or on a stage. The body is finished in a cool satin oiled Mahogany finish which looks understated and feels great. If you like Heavy Rock & Metal and want a guitar that will outlast any ‘beginner’ status, this is choice for you! Finally, we’ve included a great example of the type of boxed pack you can buy from us. In one fell swoop, you can grab everything you need to set somebody up for playing electric guitar. 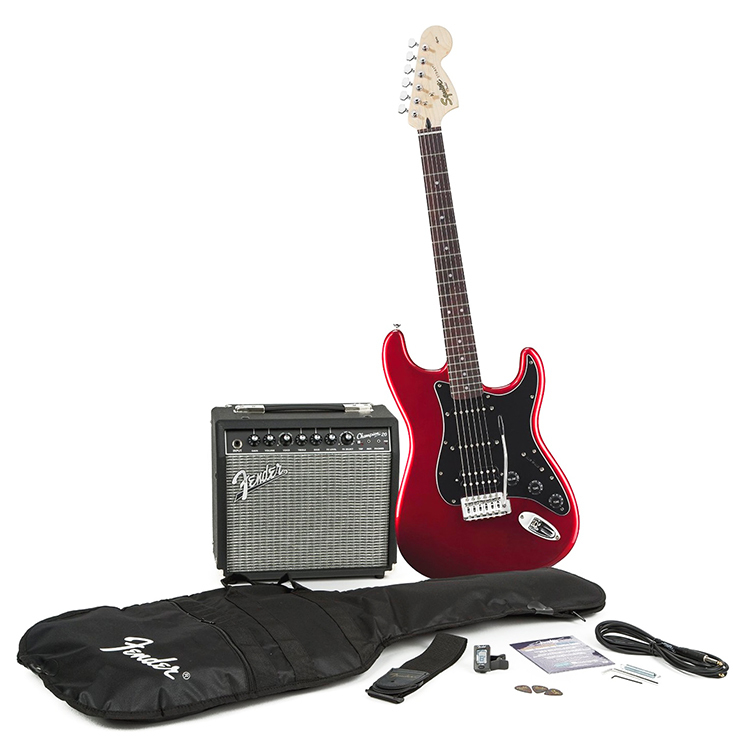 This particular pack is from Squier and it’s a cracking choice for every beginner. Inside this pack, you’ll find a Squier Stratocaster with a beautiful Candy Apple Red finish (a Fender classic) and the HSS pickup layout we saw earlier on the Yamahas. Classic looks and versatile configuration equals GREAT choice! Okay, excellent, but what else do we get in this box? Well, for starters you’ll find a great 15 watt Fender amplifier! It has clean & overdrive channels for giving you a palette of sounds to play with. You also get a guitar strap, a soft gig bag, a cable for plugging the guitar to the amp and a selection of plectrums. For a one-stop buy, this is a fantastic choice. So, there we have it. We have lots of guitars available and, of course, many of them will be equally excellent choices! However, we can definitely recommend these picks for quality, easy of playing and longevity. Make Christmas a hit with these beginner’s electric guitars! Hopefully this blog has been helpful. We understand though, that you will likely have more questions! Don’t be shy, talk to us in any of our stores or grab us online: we are here to help make your Christmas (and every other day) easier and better! Enjoy and look out for out next Top Picks article soon!